I was so excited to share with you my Convertible Tote tutorial from the most recent issue of Creative Machine Embroidery, that I forgot to also share my other project in the same issue! My Pretty in Paris article shows you how to transform Sis Boom’s Peggy Party Runner pattern into a Parisian themed display using a variety of fabrics and embroidery designs. Given the colors, I think this one could also double as a Valentine’s Day runner as well. 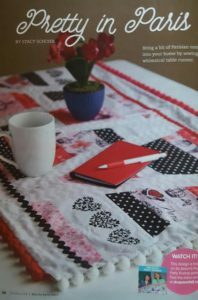 For not being a ‘quilter’ I really enjoyed the pattern…. the ‘piecing’ is cleverly put together in strips, limiting the amount of sewing small pieces that you have to do. This entry was posted in Uncategorized on April 5, 2017 by stacy. Is the pretty in Paris article in the same magazine? I need to find it. Maybe Joann or B&N? Yes it is! My Joann’s regularly carries Creative Machine Embroidery, my B&N either sells out quickly or they are just hit and miss.